Well would you look at that? Another week down and another weekend on the horizon. This household is might happy about that. Last weekend was the first in well over a month that made me feel super rested and rejuvenated — I’m looking to do the same this weekend! Last year I barely eeked out 150 wall balls in that time and got a few double unders for a score of 153. (YOUR LEGS FEEL LIKE JELLY WHEN YOU ARE JUMPING ROPE.) The honest truth though is that I was in better shape last year – so I was fairly certain that I would struggle just to get through the wall balls this year. I tried to push out all the crappy negative self-talk though and just give my best in that moment though and I ended up not only completing the wall balls but also 23 double unders for a score of 173. HOLY CRAP ON A CRACKER, I was happy. So obviously I celebrated with a little champagne afterward! 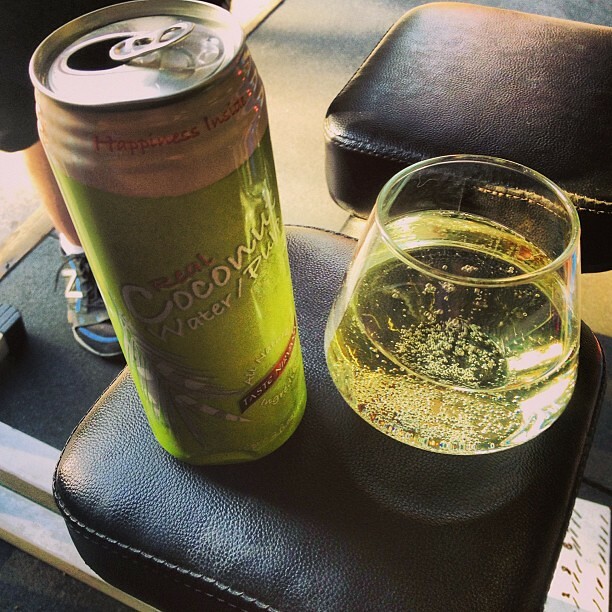 But don’t worry, I also hydrated with some coconut water too. Anyway, let’s talk about some fun things to read, shall we? *First, a truth bomb. That term is completely stolen from Danielle LaPorte, but yesterday when I read the quote at the top of this post I thought to myself: BAM! THAT IS THE TRUTH! So, you know, truth bomb is appropriate. *Life Before and After Cell Phones – HA! How true is this? So true. *Loved this reminder about habits. *So here’s an interesting story: The Professor and The Bikini Model & The Suitcase Full of Trouble Doesn’t it just sound juicy? *Watching the news all day long? Here’s how it is affecting your health. *But what will you do when you turn off the news? How about some reading: Proof that good books can change your life. *I’m a big fan of dreams and goals, but you know what I’m even a bigger fan of? Action. *On the other hand, if you ever feel like you are expending a lot of energy but not really getting anything done? Read this, please.this hysterical t shirt the other day, but it showed up yesterday in a size XL and it is MINIATURE. Sad trombone. But maybe you are miniature too, so I think you should totally buy it. Hilarious! I may have to order the mens version just because I love it so much. *I’ve talked before about the importance of being coachable, but here is some great practical advice on how to make that happen if it doesn’t come naturally to you. 153 to 173? You are SUCH a badass! Great job! Congratulations on 13.3! I’m so excited for you. That is TOTALLY awesome! I’ve had 13.2 on my to-do list, and I’m tackling it at the gym next week. I might try 13.3, too! I’ve never done that many wall balls so why not?! Who doesn’t want jelly legs?! Congrats on your workout! Soooo do you think the professor was innocent?! Love that tshirt Happy weekend! I love your Friday posts! Good stuff! And good job on 13.3! Doing it tomorrow. I’m not familiar with the recipe, but I’ve been subbing prosciutto for bacon in some of my cooking. The ingredient list reads “ham, salt” for the kind I get at Wegmans.